It is my intention to have a far, far happier thousandth day than that poor Anne Boleyn apparently did, and since my thousandth post occurs on this, a Tuesday, I will enhance my happiness by thinking and writing about food. It’s such a reliable way to fill myself with good cheer, filling myself with good food, that—well, you all know by now that I can’t resist thinking and writing about it here at least once a week as well. Am I insatiable? Perhaps. I am certainly mad for good food and drink. I’m kind of crazy for messing about with cookery trickery myself, and most certainly that feeds (both literally and metaphorically) my cravings. And you know that I’m happy to indulge at every turn in talking and/or writing about food and drink, making photos and artworks about them, and dreaming up ever more new ways to get ever more treats into my hands, my glass, my spoon and my stomach. That’s how I operate. Naturally, the right thing to do in celebration of a thousand-day-versary would be to make some party treats. I have company coming over shortly, so I thought I really ought to make those dinner and lunch engagements into occasions for those goodies. Any excuse will do. The excuse of friends’ visits? Irresistible. Dinner first, with a couple of friends on Monday. Starter: an appetizer of crackers topped with a nice Dutch gouda or brie, or spread with some homemade brandied beef pate and a little bit of fig jam. 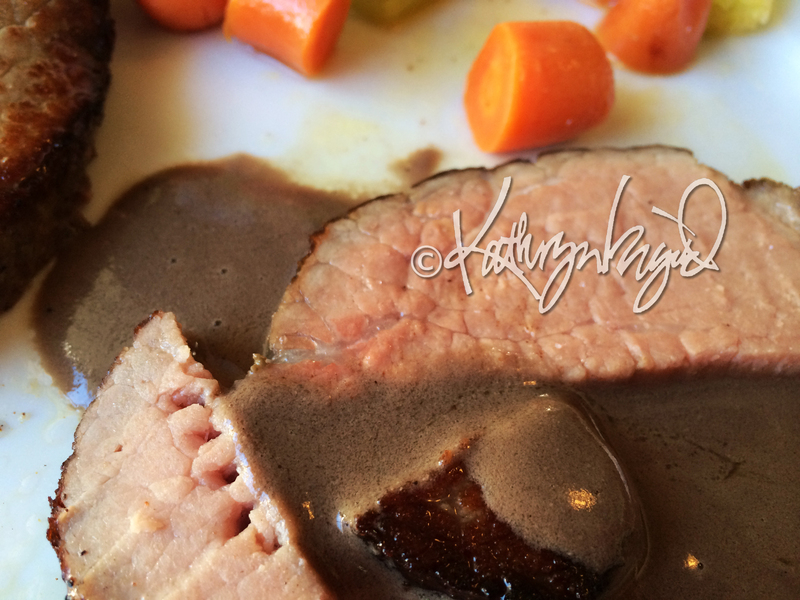 Roast beef, a nice chuck shoulder roast cooked simply sous vide with butter, salt and pepper, as the centerpiece. Mashed potatoes sauced with a bit of beurre rouge and pan juices. Tiny peas with mint butter. Sweet corn with crispy bacon. Some quick beet pickles. Chocolate mousse with apricot coulis spiked with homemade orange liqueur and topped with chopped dark chocolate bits for dessert. Lunch on Thursday with another couple. Mint-apple-honeydew cooler to drink. Shrimp toasts as a starter: butter-fried slices of chewy French bread with spicy lime avocado spread and tiny sweet shrimp on top. Pasta with smoked salmon and langoustines in lemon cream for the entrée. Carrots and celery in cooked in white wine with snippets of dill. Ginger coleslaw with Bosc pears and toasted sliced almonds. Fresh strawberries and cardamom shortbread with salted caramel icing for the big finish. I always hope that everyone lunching or dining with me will enjoy everything I’m feeding them, but I have to admit that it’s kind of a big deal that I like it all, too! How else will I get fat and sassy in my old age? I may be ahead of the curve on the Sassy part, but I’m still hoping to be somewhat moderate or at least slow about the fattening-up part. Not that you could tell by my eating meals like this whenever I can get my gnashers on ’em. But here we are and I haven’t ballooned out of existence quite yet, so no doubt I shall continue my food adoration for at the very least another thousand days. Or whatever…come back and ask me later; I’m heading to the kitchen. 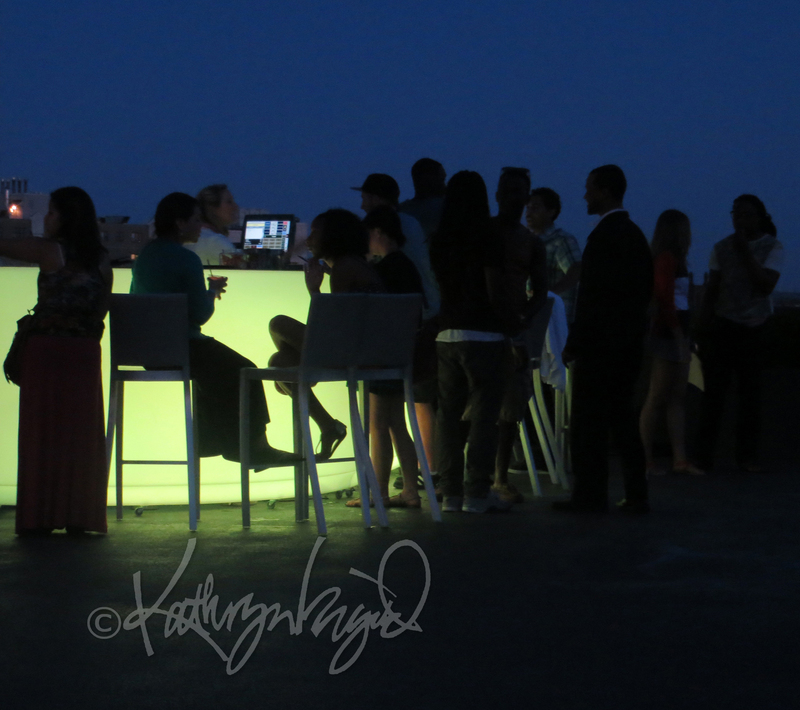 Recipes will undoubtedly follow…. Just because I’ll eat practically anything doesn’t mean I don’t care what I eat. I would far rather wait a bit longer between meals than eat something not entirely thrilling just to fill myself. On the other hand, if it’s dinnertime and something I was fixing didn’t come out entirely the way I planned it, I’m loath to let it go to waste. So while the skillet potatoes I put together for a recent meal weren’t quite what I had thought I was going to have, I ate them without much complaint, and so did the others at the table. 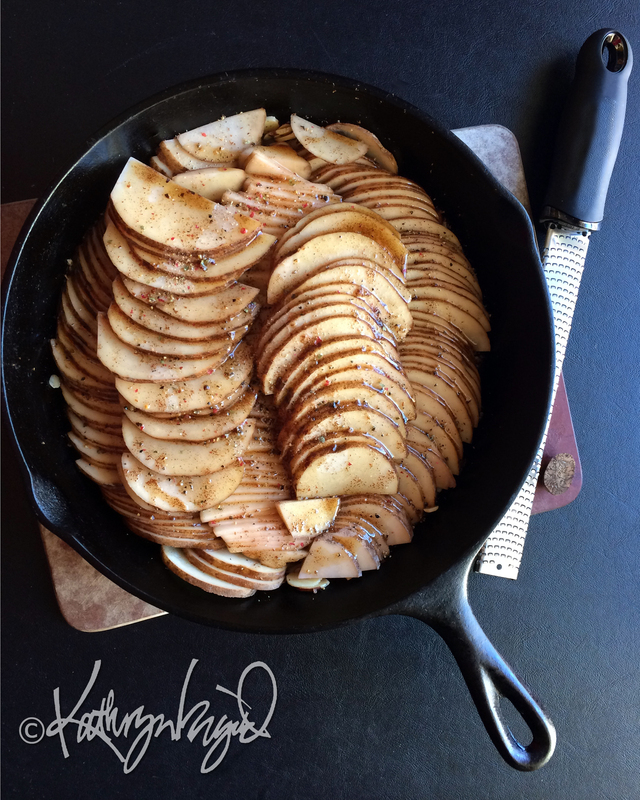 I made them from thinly sliced raw russet potatoes, the peel still intact, and thought to create something between a country-fried potato dish and Hasselback potatoes and yet different, layering these on top of a handful of sliced almonds, seasoning the potatoes on top with salt and mixed pepper (my home grinder blend of pink, white, green and black peppercorns and whole cloves) and drizzling the whole dish with a small splash of almond extract and a very large splash of melted browned butter. The verdict after baking: good concept, poor execution. I liked the flavors very much but the texture will be far better next time when I add a good dose of broth to the pan to soften the potatoes into submission. Better luck next time, I say to myself, but hedge my bet for the current meal by choosing a trusty standby for another part of the dinner. For vegetables, the range that will please my spouse is very narrow, and though I’m not averse to making separate things that I alone will eat, on a day when I wasn’t fully satisfied that one part of the meal was exactly as I’d planned it so we’d both enjoy it to the highest degree, I opted to keep on the ultra-safe side by using only the most uncomplicated and uncontroversial ingredients. 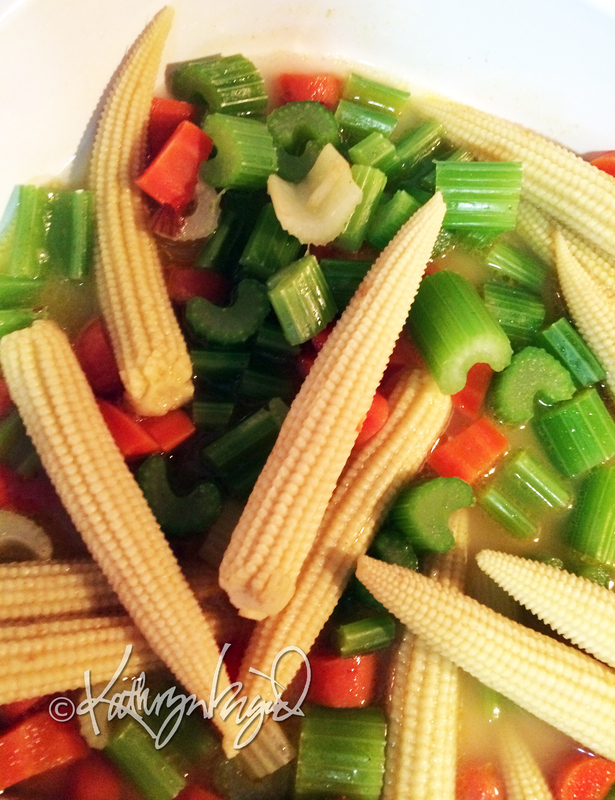 So I just steamed some nice carrots and celery and baby corn (not pickled), buttered them up, and Lo, it was very good. When it was all plated up it didn’t look like a recipe fail day at all. And it was all perfectly edible, if some in more appealing ways than others. 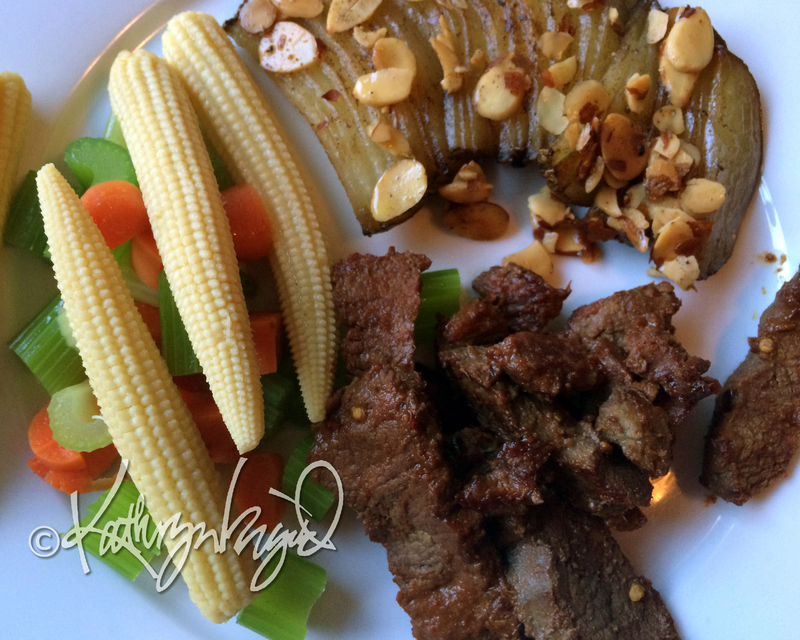 The last part of the meal to get prepared was fairly quick and simple, and despite being an untried variation on my standard approach to a stir-fry of beef it wasn’t so far afield that I didn’t trust its outcome. So while the pan was heating up, I sliced a lovely grass-fed skirt steak and whizzed up the frying sauce of fresh ginger root (about two tablespoons of small-diced root that I preserved in vodka in the fridge, with just a dash of the vodka to help it blend), Tamari, lime juice, a tiny bit of honey, and a sprinkle of red pepper flakes. Spicy but not fiery, and full of fresh ginger flavor. Quickly searing the beef and adding the sauce at the last so as to keep it from scorching while it could still caramelize a bit, I gave a shout to my dinner partner in the other room, and we piled up our plates. The potatoes were fine, if not exactly stellar; the vegetables were predictably comforting in their apologetic simplicity after the potato near-miss, and the beef was tender and zingy with ginger’s welcome tingling heat. I’d say I’m working my way up in the culinary world, gradually at least. 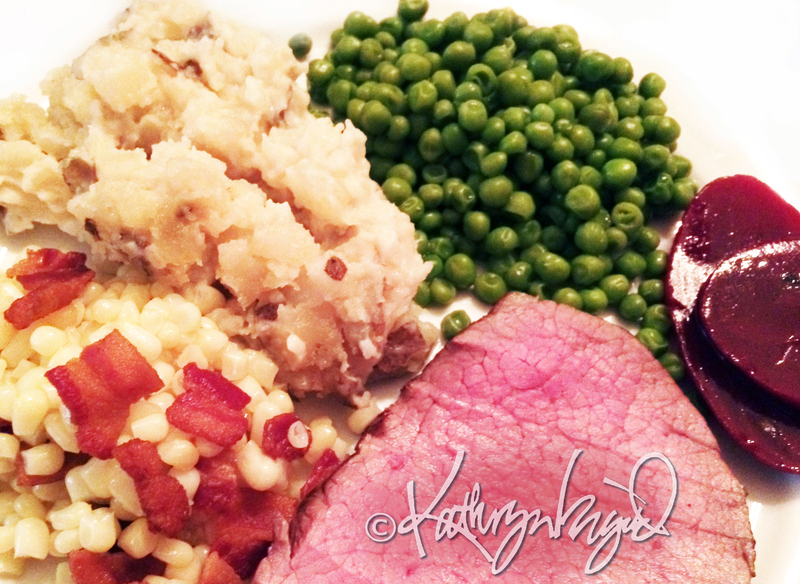 Foodie Tuesday: Good Gravy, Man! Things should never be made harder to accomplish than they already are. I am a fond aficionado of sauces and gravies and syrups of all sorts, but many of them are so famously hard-to-assemble in their rare and numerous ingredients and even harder to assemble in their finicky techniques that I am cowed into quitting before I even make the attempt. Gravy shouldn’t fall into that category, but often, it does. If you’re like me and not superbly skilled at even the most basic tasks of cookery, making a perfect roux or incorporating any of the standard thickening agents into a fine meat sauce without outlandish and unseemly lumps and clumps is about as easy as it would’ve been getting 50-yard-line tickets to the Superbowl. Which, as you know, and as is also the case with the gravy perfection, I had no intention of ever attempting anyway. But here’s the deal. If you find a technique that does work for you and requires little effort and no exotic ingredients and can be varied in a number of ways once you’ve mastered it, why on earth wouldn’t you go to that as the default recipe? I’ve found the little preheated-pan trick I learned from Cook’s Illustrated for roasting a chicken so nearly foolproof and so delicious that I use it every time, even though my oven is showing such signs of impending demise that the merest whiff of said pan in its vicinity gets the smoke billowing right out the oven door and the alarum bells a-yelling even when the oven is freshly spick-and-spanned. Now, you may say that it is not the recipe or even the oven that’s at fault but rather the idiot who is willing to risk life and limb to roast a chicken in a dying, antiquated oven, and you would be correct, but that’s not the point of this little exercise, now, is it? I’m merely highlighting for you the immense appeal and value of a tried-and-true, easy recipe. 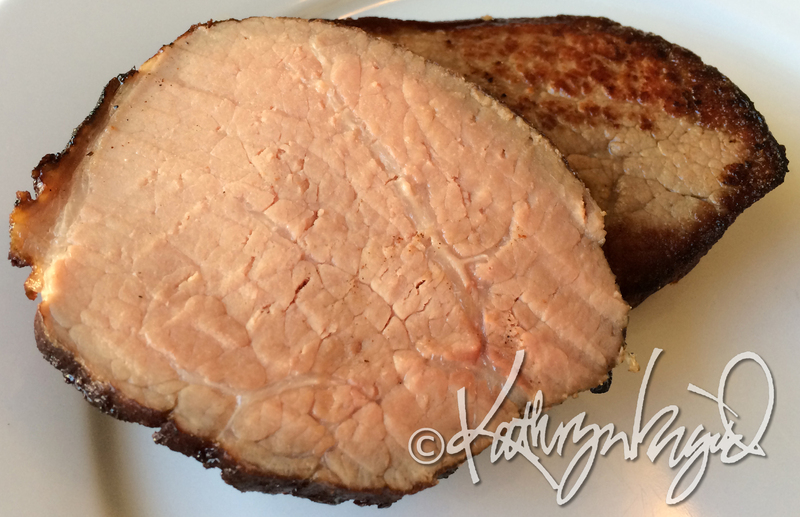 The same can be said of using my much-appreciated sous vide cooker for a reliably fabulous roast beef, medium rare from edge to edge and tenderly moist in a bath of its own juices, salt and pepper and a knob of butter, so flavorful that it needs little more than a quick searing caramelization to be more than presentable at table. But while it requires nothing more, it is in no way harmed or insulted by the presence of side dishes, and with them, a fine gravy is a benevolent companion indeed. And as I am not one to be bothered with fussy preparations, the nicest way to make gravy in my kitchen is to pretty much let it make itself. So when the roast is done hot-tubbing it sous vide, out it comes, gets a quick rest so that some of the juices that have emerged from it during its bath return to their appointed place in the roast before I cut the cooking bag open, and then I get the real sauce-sorcery underway. I pour the buttery juice from the bag into a microwave-proof container and nuke it until it cooks and coagulates, as meat juices will do. Sear the roast in a heavy pan and set it aside to rest again. To continue, deglaze the pan with a good dousing of whatever tasty red wine you happen to have handy, a cup or two if you can part with it from the drinks cupboard, and just let it reduce at a simmer until it thickens slightly all by its little ol’ self. In just a few minutes, it’ll be quite ready for the big, saucy finale: puree the clotted microwaved juices and the wine reduction together (use a stick blender, if you have one, so you can keep the ingredients hot without exploding your blender!) until they’re silky smooth. Adjust the seasoning if you like, but it’s already going to be mighty delicious, don’t you worry. Easy does it. Isn’t that how it’s supposed to be? Now, eat up, everybody. P.S.—don’t think because you’re a vegetarian you’re off the hook with this one. This not-even-a-process works pretty easily with nearly any roasted vegetables too. Deglaze your roasting pan with wine or, of course, some fabulous alcohol free homemade vegetable broth or some apple juice, and reduce it a bit; the final thickening agent is in your pan of roasted vegetables. Just take a nicely roasted portion of the plant-born treats and puree that goodness right into the pan reduction and Bob, as one might say, is your parent’s sibling. Your gravy is done and ready to shine. Be saucy, my friends! 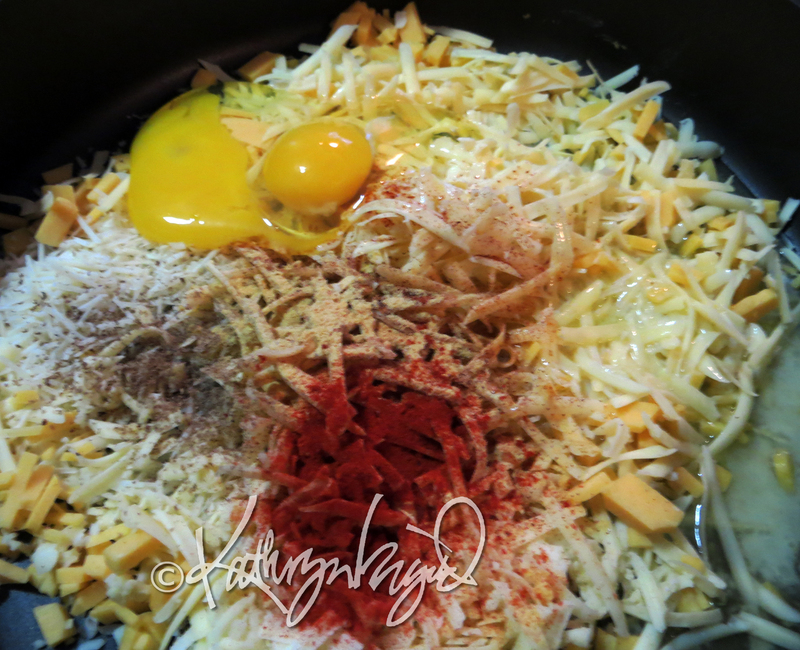 That old expression about making a hash of things implies wreckage and ruination, but there’s a different and much lovelier kind of a hash that results when one finely chops or shreds a bunch of tasty ingredients (leftover or not), mixes them together and cooks them. It’s generally easy to make, and a good way to expand small amounts of ingredients to feed a larger hunger, and when made with a reasonable amount of care and/or experience, it can be very tasty, too. 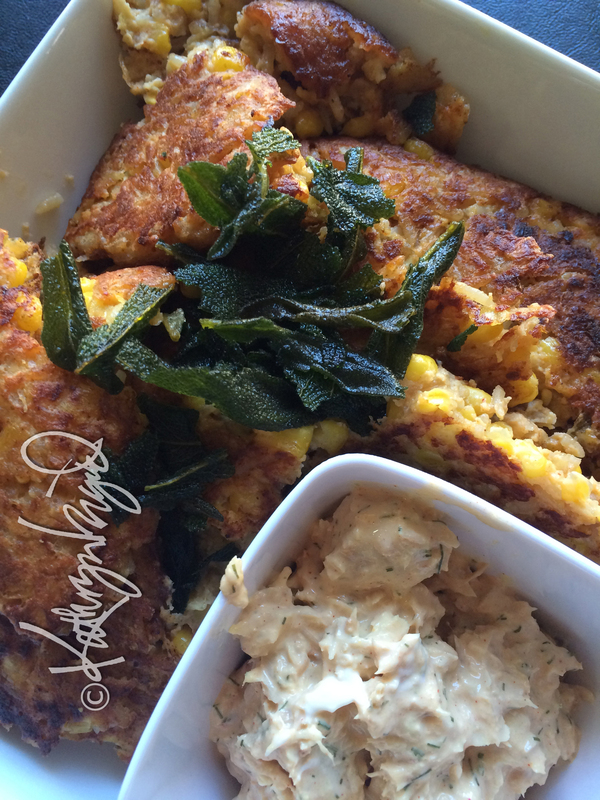 The typical mix of protein (usually meat) and potatoes that serves as the base of a hash is worthy of enough admiration that the technique–I daren’t call it a recipe—has quite deservedly survived for ages. Still, there’s no reason not to use the methodology with a little twist or two on occasion if mood and ingredient availability so move you. The most recent version appearing on my table lacked both meat and potatoes but still ended up with the texture and character of a fairly classic hash, to my mind. I seasoned the blend with salt, pepper, a little shredded Parmesan cheese and a dose of smoked paprika and then I mixed in an egg to hold the equal parts of cooked rice and creamed corn that I had on hand together a little more like those starchier potato shreds would be, and when at last I put in a fair amount of olive oil, it all fried up in the skillet to a nice crispy-outside cake with a moist interior, and broke up easily with a gentle poke of the fork when I’d loaded that utensil up with a nice creamy bite of dill-seasoned tuna salad. Some fried sage leaves made a nice topper. No potatoes? No meat? No problem. Besides being a wise quote from my perennial hero, Yukon Cornelius, the title of today’s post is pretty great advice for eaters at all times, most particularly so during the holidays. If I’m going to go to the expense and effort to do anything special for a Special Occasion, it matters far more to me that I want to eat the results than that they meet anybody else’s standard for tradition, impressiveness, or perfection. You won’t find me dining on dainties of glorious extravagance and beauty on a holiday or birthday or any other notable date if I’m the designated cook, because spending exhausting and exacting hours in the scullery before the blessed event is not my idea of a great way to arrive at it rested and ready to enjoy its importance in my life with good cheer and an even temperament. 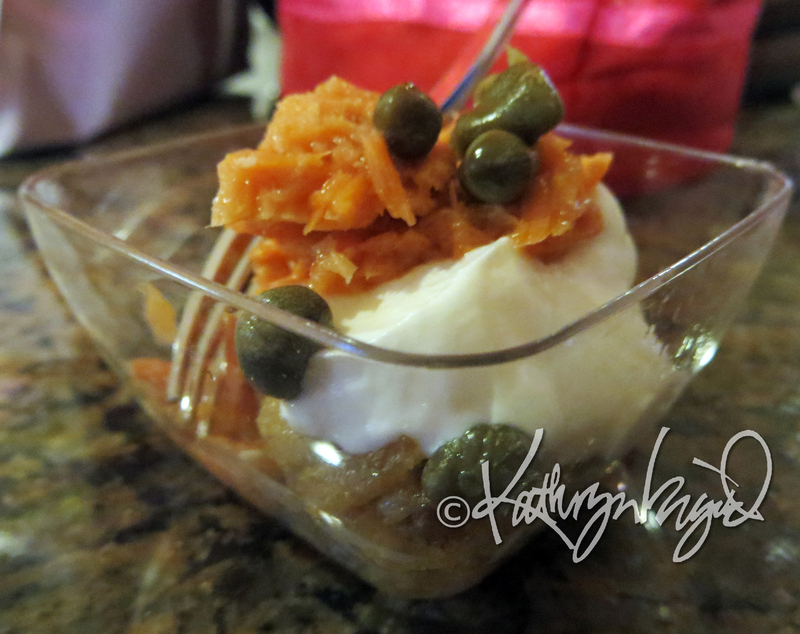 Appetizer parfait: hash browns (I made these with Gouda and smoked paprika), sour cream, hot smoked wild Pacific salmon and capers. Or, in the alternative version I offered on the same day–another easy to prepare ahead topping for the hash browns–smoked sausage pieces simmered in Pinot Noir BBQ sauce. The sauce was a sticky reduction of equal amounts of red wine and homemade bone broth with brown sugar, tomato passata, chili powder, cinnamon, cloves and cayenne to taste. Guests could assemble the tiny dishes with any combination they liked, and I didn’t have to wrestle with the hors-d’oeuvres at all on the day of the party. So while I adore Dungeness crab, I will not likely be preparing one fresh and mucking about with the tedious chore of meticulously picking the meat out of the shell–if I can find fresh Dungeness already picked and packed in a neat little carton, it’ll be on the menu; otherwise, not. My fondness for elaborate baked goods will likely be fed by an outstanding bakery, not by my slavish efforts right before a party. I’ll happily dine on a perfectly frenched rack of lamb or a miraculously flaky and tender kulebiaka or bistilla, but only if someone else is going to all of the effort it takes to prepare it. Homemade macaroni and cheese can be just as easy to fix as pre-packaged. Here, I blended shredded Gouda, cheddar and Parmesan cheeses in about equal amounts and added melted butter, eggs, smoked paprika, powdered mustard, a little grated nutmeg, and a tiny dash of liquid smoke (no additives, please) before stirring the cooked pasta in with a bit of cream and baking it to melt and meld it all together. That’s how, when Christmas dining is at home, it may go so far as to be a roast beef that can be cooked sous vide and requires only a quick browning in the oven before carving, but it might also be a made-ahead, very down-to-earth macaroni and cheese. Or even a tuna salad sandwich, a perpetual favorite that, while it’s hardly what anyone I know would consider Fancy, is gladly eaten with a handful of good potato chips and a juicy apple on nearly any occasion chez nous. I want to eat delicious food on Christmas, but it doesn’t have to be unusual or expensive or showy in any way to be delicious, and if its simplicity of preparation means that it’s eaten in a very comfortably relaxed state, that makes it all the more appealing and enhances its flavor remarkably. Homemade mac-&-cheese is, in fact, also easy to customize for any number of tastes and occasions, as when I change out the elbow macaroni with some fresh fettuccine and toss in a batch of Langostino tails. Voila! 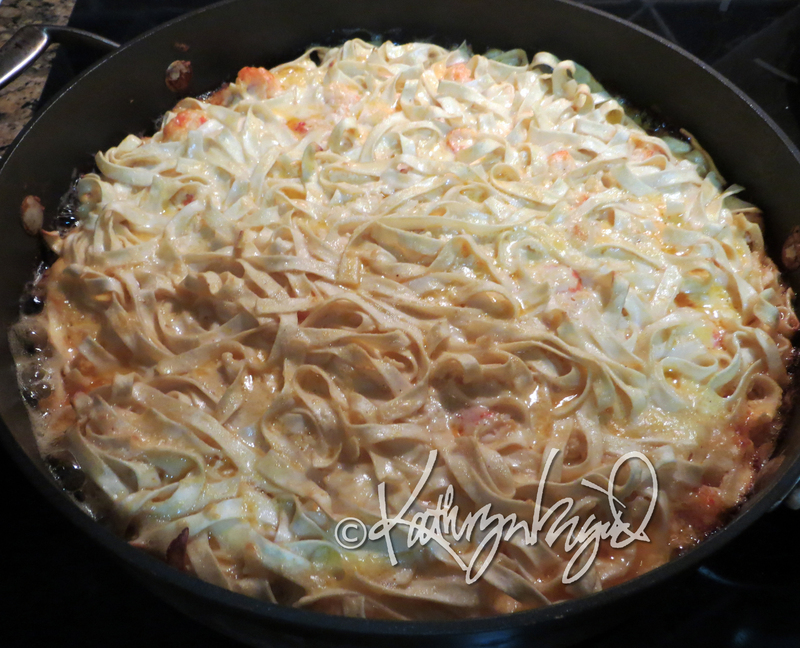 ‘Poor man’s’ lobster fettuccine. I hope that everyone who is celebrating around now–whether it’s Christmas, the Dongzhi festival, Hanukkah, the Winter Solstice, the New Year, Kwanzaa, a birthday, or something entirely different–has the wealth and freedom to take the same approach. It’s satisfying to arrive at happy events relaxed and, well, happy. And eating what you love to eat is always better than eating what you think you should eat, only because you think you should. I wish you all great food, simply prepared, great company when you want it and quiet time away when you need it. That’ll make the food taste all the better when it comes. Cheers! Bon appetit! Joy! Who says plain salt-and-pepper roasted chicken isn’t fancy enough for a special occasion? If you enjoy it, indulge. 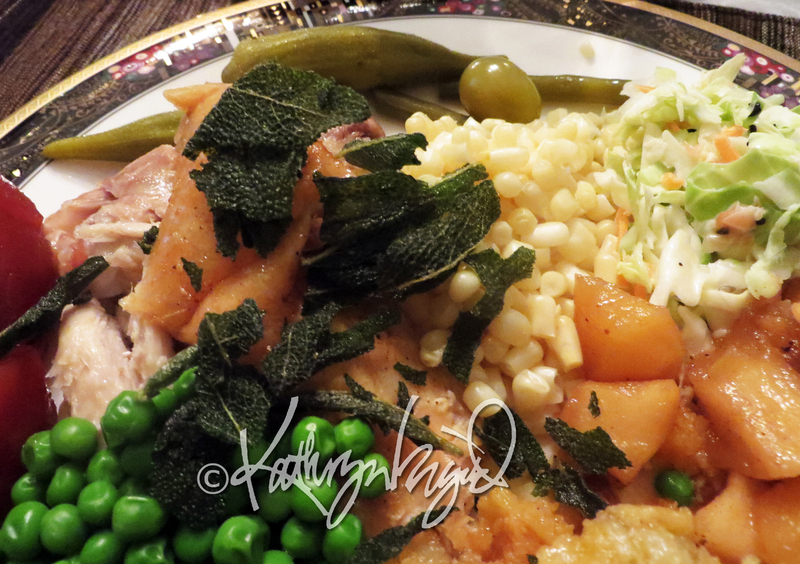 Even with the most common of accompaniments, it can be satisfying and tasteful (clockwise from the ruby-colored jellied cranberry sauce at left): pickles (here, okra, green tomatoes and green beans); sweet corn; coleslaw; apple sauce (freshly made brandied maple sauce); mashed baked potatoes with beurre noisette, fried sage leaves and optional red wine/broth reduction sauce; and a spoonful of tiny, tasty green peas. And if you’re a vegetarian, you can always eat the whole rest of the meal and be content. Peas to all the earth, I say! Even desserts–maybe especially desserts, come to think of it–can get treated like such elaborate Fabergé egg-like constructions that they are too precious for ordinary mortals to eat and far too tiring for me to slave over preparing. I’ve hardly ever seen anyone turn up his nose at store-bought ice cream or refuse if I offered her a nice piece of chocolate straight out of the wrapper. A bowl of perfect fresh strawberries, a moist pound cake made the other day, and a quick batch of whipped cream with vanilla give instant summer cachet to the end of a meal. Banana pudding needn’t even be a fuss, and doesn’t look really like much (hence the lack of a photo), but it’s unpretentious and tasty enough that everyone right down to the toddlers will happily eat that old comfort favorite. Blend together until smooth (I use the stick blender for this): 5 overripe bananas (too mushy for eating plain), a pinch of salt, the juice and grated rind of 1 large lemon, a generous teaspoon of vanilla, a couple of tablespoons each of raw honey and butter, and about a cup of heavy cream. Chill until thickened. What do you taste? Bananas. What will you do? Go bananas over it. Why work harder than that for your food and fun? Enjoy your holidays and happy days instead! Oh, and I must add (since what goes without saying may not entirely go without saying for everybody!) that this kind of banana pudding will, of course, oxidize–unlike the aforementioned imitation stuff–so it’s best eaten right when you’ve made it unless you’re like me and don’t care if it’s a little beige in color. And it’s not super thick, so if you like it thicker, I recommend whipping the cream separately and then folding it into the blended banana mash, to which you’ve already added the other ingredients. No matter how you choose to make it, it’s still pretty tasty. And, as Marie has suggested in the comments and I’ve already tested, it makes a dandy breakfast! There are plenty of good reasons to love winter eating. Every season has its particular pleasures and what appeals and tastes best varies with the weather, activities particular to the time of year, and winter–whatever challenges the season may present in terms of work and play–is rich in favorites too. What I tend to love in winter is mostly the kind of food and drink that spells comfort in colder weather: roasted, fried, grilled, hearty, spicy and/or deep flavored comfort is particularly welcome at my table. 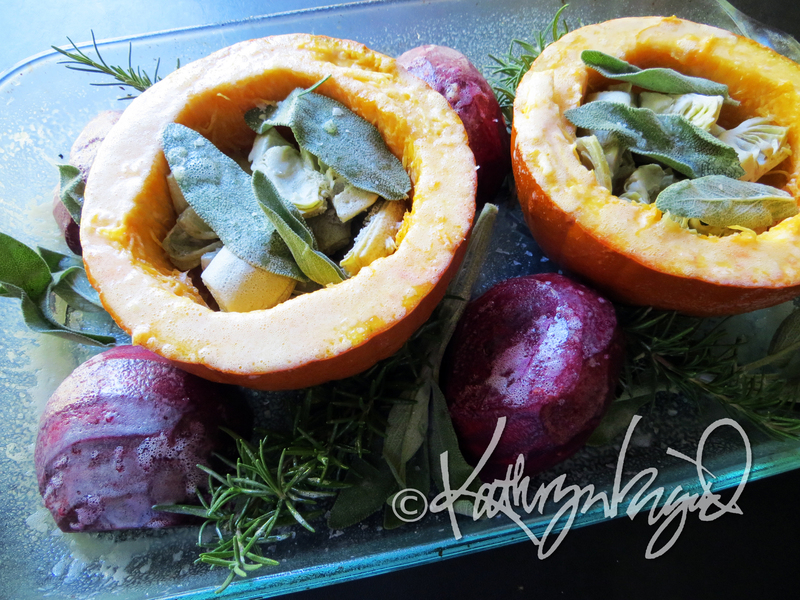 Roasted squash stuffed with artichokes and sage is complemented by roasted beetroot and rosemary. They can all go in the oven at the same time, too, with just a little supervision! 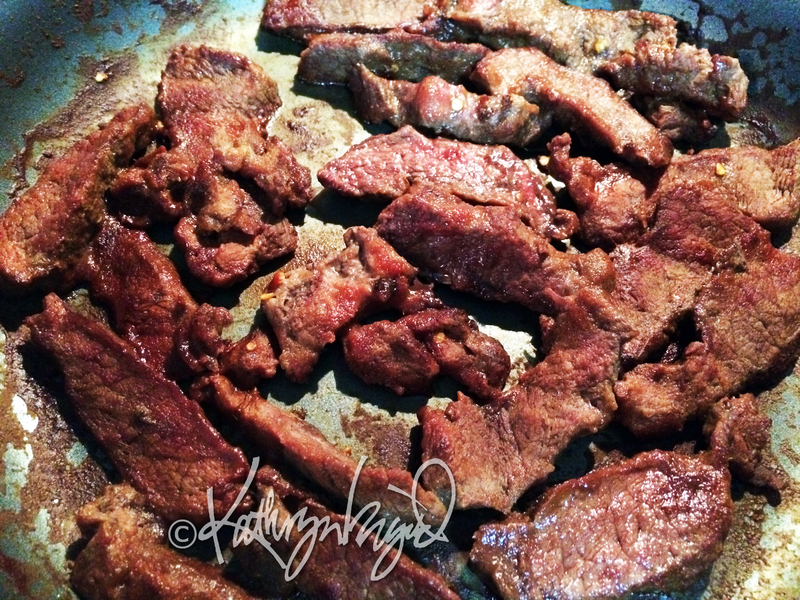 Shredded slow-cooked or roasted meats like spicy chicken or [pork] carnitas are filling and satisfying. If there were roasted vegetables yesterday, a mash or puree of them can make a lovely accompaniment to today’s entree. 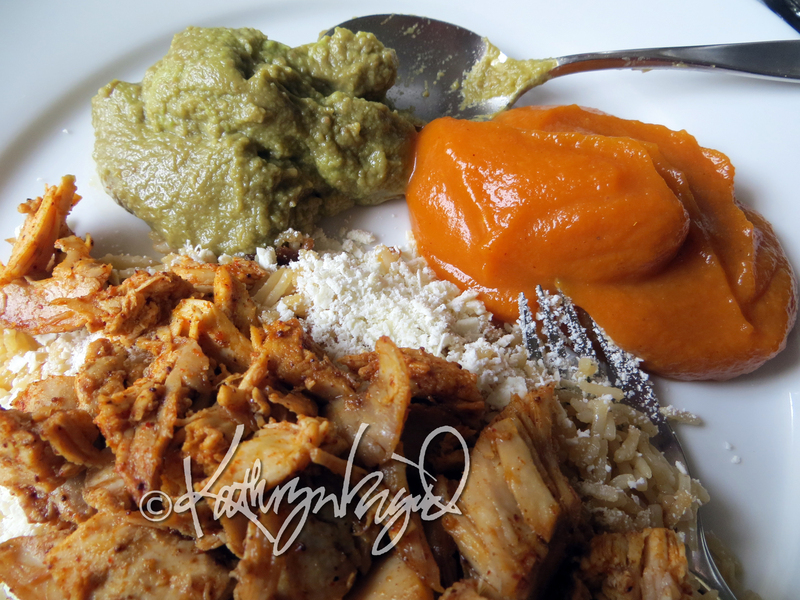 Simple, silky carrot puree with lemon juice and butter, for example, works in companionable comfort with the coarser mash of guacamole–the latter, easily made on the fly when I keep some mashed avocado handy. 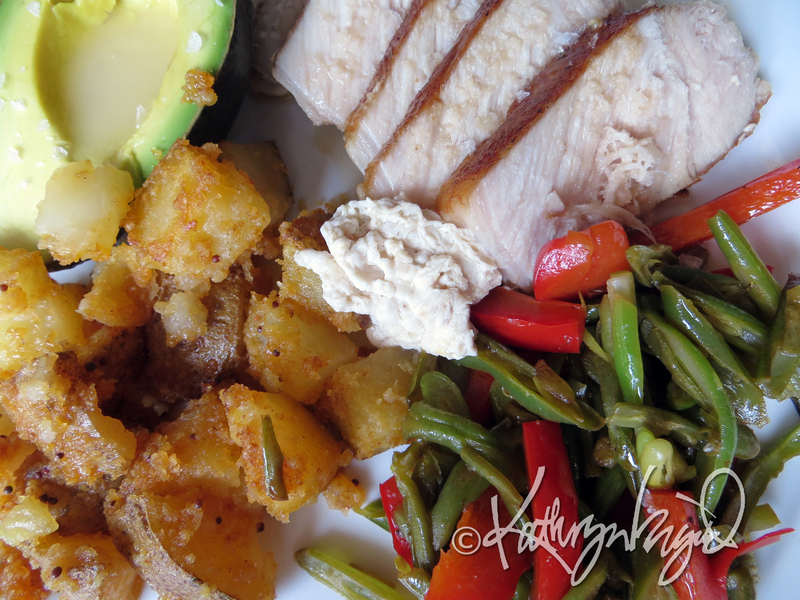 A moist and tender pork roast, with a half avocado, some pan-fried green beans and red capiscum slivers, and potatoes roasted in the oven with butter, salt and pepper, smoked paprika, mustard seeds, and crushed cheddar cheese puff crumbs, makes a grand and gratifying meal. 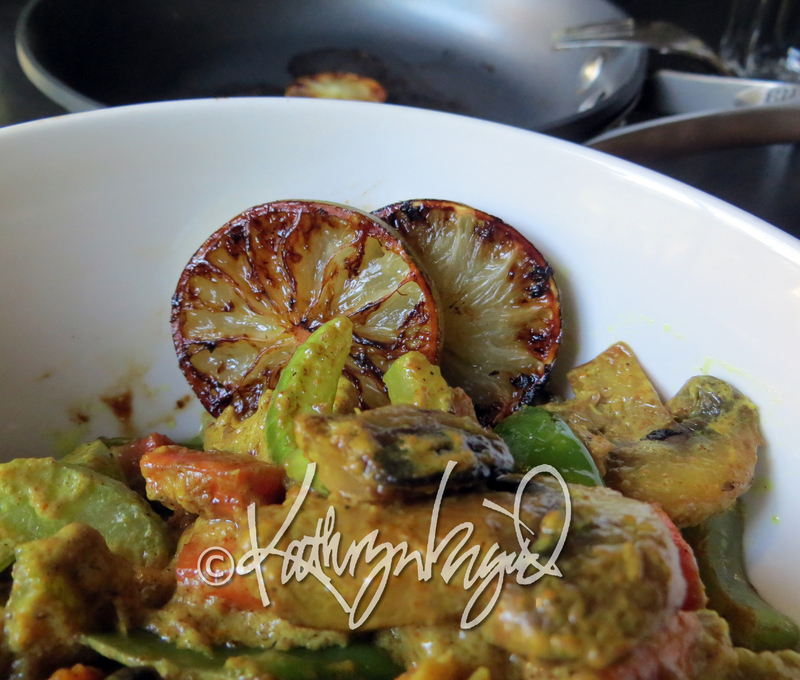 A good curry (at our house, nearly always nothing more than good coconut milk spiced with homemade sweet curry masala*) is a great way to combine any sort of roasted, grilled or sauteed vegetables, with or without seafood or meat. A couple of pieces of grilled citrus for drizzling into the curry to taste, adds a nice bright note that can bring a dash of sunshine to the winter, too. A curry masala recipe, courtesy of the late Quentin Kintner of Port Angeles, WA. I think Q would approve of my sharing this, since he was generous enough to share it with our family in the first place! Grind the spices together and store carefully away from light and heat; I use a dedicated small coffee grinder for my spices. That’s all there is to it! This masala freezes well, if you’re not fast enough to use a whole cup of it up quickly or are planning to give some away. I like to make a double batch (about 2 cups) since it does keep. It’s wonderful toasted in either a dry pan or a little ghee before adding to various dishes, savory or sweet. 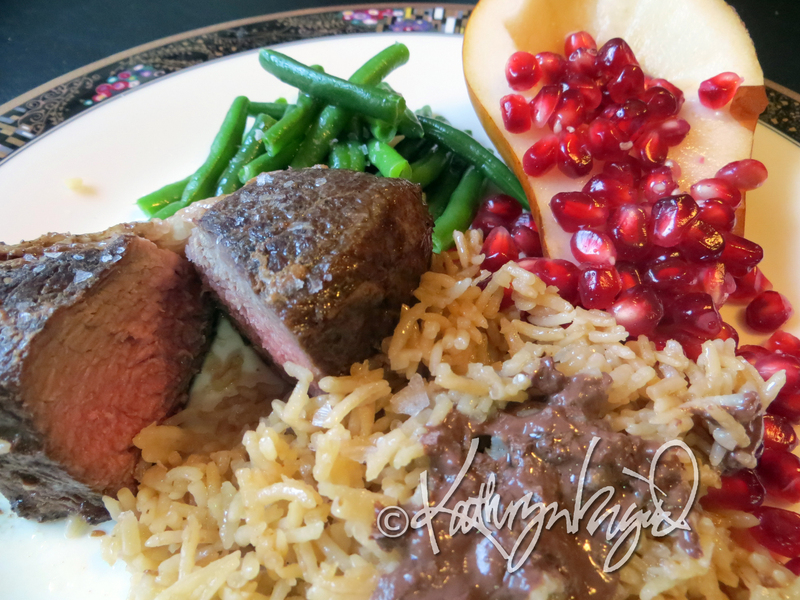 Even the standard steak dinner, sided with rice and vegetables, can be jazzed up a little for winter with some seasonal fruit favorites as garnish. Here, a perfectly ripe pear and a handful of brightly-sweet pomegranate arils please the eye as wonderfully as they do the palate. As though these things were infinite. One of the delights I most admire in this season is earthy flavors. An abundance of root vegetables and mushrooms signals time for soups, stews and sauces whose savory riches warm body and soul and recall me to the embrace of home and childhood in many ways. A simple creamy soup loaded with mushrooms is hard to beat for succor on a grey and blustery day. A bouquet of cauliflower roasted with nothing more than a quantity of butter and salt and pepper until just-right is heavenly; adding sage leaves to the butter and a handful of shredded Reggiano to the top of the cauliflower just when they’ll have time to crisp and brown lightly moves the easy dish to a higher floor in the heavenly skyscraper. Roasted vegetables of any kind are especially welcome in the cooler seasons, and so easy to toss together with a little olive oil or butter in the oven while everything else is being prepared for the table that it’s almost a crime not to put them in the oven. Throw a chopped lemon in to roast with them and they are sauced in their own juices. Put the remains (if any) the next day into a bowl with a cup of hot homemade broth and a poached or soft-cooked egg or two, add cooked rice or noodles if you like, and, bibbidi-bobbidi-boo, (or bi-bim-bap! ), you have a bowl full of nutritious, delicious, and not at all ambitious goodness right in your own little corner of this magical autumn season.